A Fiji delegation led by the Deputy Speaker Hon. Ruveni Nadalo participated in a tree planting ceremony as part of a Seminar on Climate Change in Ho Chi Mihn City, Vietnam. The delegation, which included the Assistant Minister for Local Government, Housing and Environment Hon. Lorna Eden and parliamentary staff, joined 200 representatives from the parliaments of 24 regional countries and international organisations. The ceremony was conducted after the delegates of the Seminar visited Dan Xay residential area, which is often inundated by tidal surges suffered from land erosion. Unplanned land reclamation for housing has not helped the recovery and development of the submerged ecosystem. Inter-Parliamentary Union President, Sabre Chowdhury said the IPU symposium on climate change response for the parliaments in the Asia-Pacific region is not simply a dialogue but also demonstrates legislators’ actions in the face of climate change. Mr Chowdhury added that planting new trees will enrich the ecosystem and reduce the emission of carbon dioxide and other greenhouse gases. He also expressed his hope that delegates attending the Seminar will promote planting of trees in their own countries. According to Mr Chowdhury, as 80 percent of natural disasters are caused by climate change, the key in responding to climate change is to cope with natural disasters. He noted that 88 percent of those who are affected by natural disasters in the world are in Asia-Pacific, therefore, it is necessary to put forth more dynamic strategies for women, children and humankind to mitigate impacts of natural disasters. Deputy Speaker Hon. Ruveni Nadalo said that it’s good to learn the best practices of other nations in tackling climate change and that real actions to remedy the impacts of climate change are taking place. 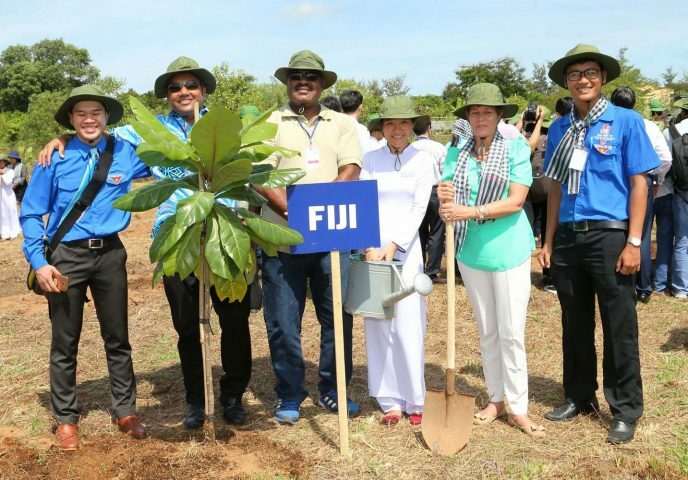 The trees were planted in an area zoned off for building the Rung Sac Cultural Park in Can Thanh town of Can Gio district on Saturday last week. The 50 new bang vuong (Barringtonia asiatica) trees can adapt to drought and other severe climate conditions.